One of the biggest names in Hong Kong’s art world, Wing Shya carved out a reputation working alongside Wong Kar-Wai as the iconic director’s exclusive set photographer before becoming well-known in his own right for his compelling and unique artistic vision. Ahead of this year’s Art Basel, Shya is coming to LOFT22 in LKF’s California Tower with a new exhibition, Sweet Sorrow. This series of photographs depicts bold but isolated figures standing out against a chaotic, urban landscape. With these images Shya seems to suggest that in an era of constant acceleration, success and fame are empty pursuits. 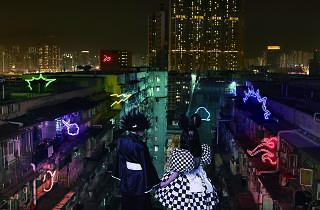 But the dark theme of the photographs is undercut by the use of Japanese manga references and stabs of vibrant colour. Glimmers of hope and beauty in the darkness. Sweet Sorrow, Shya’s first charity art initiative in Hong Kong, is presented by the Hong Kong Adventist Hospital Foundation and raises money for the charity’s Cancer Fund, which supports underprivileged cancer patients in Hong Kong with free scans, diagnosis and treatment services.